This set comes with a bunch of sentiments and a die, I used it hear as a cutout, it has stitching inside and outside. Fun New Year set. I also used the balloon dies and stitched rectangular dies. Beautiful card Brgit. I just love the color combo you used. OMG Miss Brigit...What a Gorgeous & Spectacular Card. Love all of your balloons and your super clever way you used the new die....to showcase the sweet sentiment. You Definitely did a Super Outstanding Creative job!! YOU so ROCK!! Awesome card. 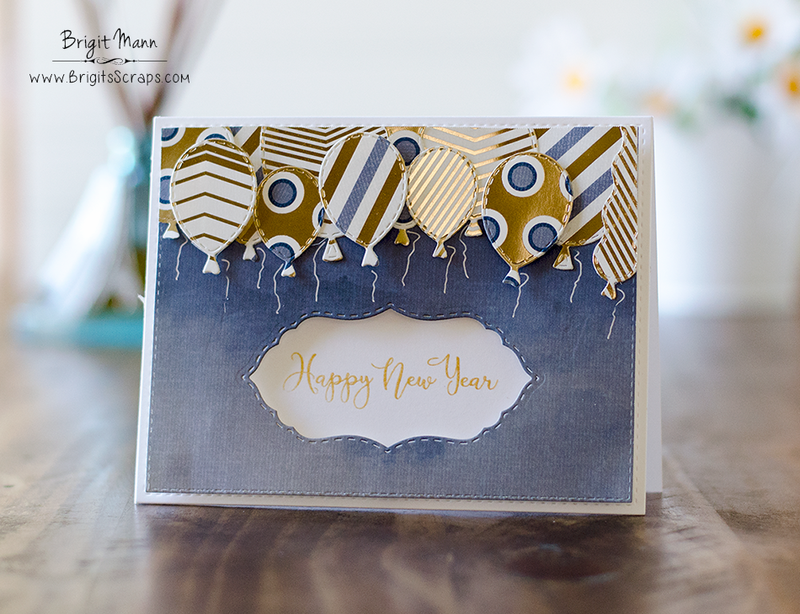 Love the blue and gold and can see a New Years party when looking at your beautiful card. I love this card, Brigit! Your balloons are so pretty! Cute card I love how the balloons floating in the air, way to go! Love all of the balloons. What a great card. I love designs that can be girl or guy cards by merely changing the color or design of the paper. These new stamps and die will be a great addition. This is a beautiful card! I love all the balloons at the top almost like a balloon drop on new year's eve! So cool! Thanks for sharing! I love your beautiful balloons...this is such a pretty card! Beautiful card Brigit! Love the colors!! Gorgeous balloon topper. Completely love. Such a beautiful card! I love the fun balloons!! Love your card. The colors you used look great.